Motorcyclists take to the same roads as cars, trucks and buses. But those drivers often fail to understand the unique road conditions motorcyclists face. Motor vehicle drivers often travel too closely behind motorcyclists or do not provide them extra room to turn at intersections. This type of driving can lead to motorcycle accidents and result in serious injury, including broken limbs, cuts, bleeding, scarring, internal injuries and head injuries. While traffic accidents are always scary, motorcyclists are among the most vulnerable in collisions. They are the most exposed on the roads and often suffer the most severe injuries. But motorcyclists are not entitled to the same no fault, Personal Injury Protection (PIP) benefits that are available to injured motorists and bicyclists. These benefits, which are available through your auto insurance policy, pay the first $8,000 worth of medical bills. Without these benefits, motorcyclists may face challenges in paying medical expenses and obtaining prompt reimbursement. 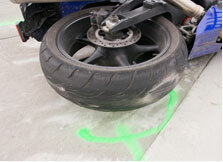 If you are involved in a motorcycle accident, you should be evaluated at the hospital. Even if you do not think you are injured, it is important to make sure you have not suffered internal injuries or a head injury. If you are injured in a collision involving another driver or if a loved one died in a motorcycle accident, the next thing you should do is contact a skilled Boston motorcycle accident lawyer. A lawyer can watch out for your best interests as authorities investigate the accident. The result of the investigation will be important if you need to file a negligence claim against another driver. It is also important to contact a lawyer because you may have large medical expenses. If you need to take time off from your job, you will need to seek compensation for lost wages. You may also be entitled to other damages. The Massachusetts personal injury lawyers at Bellotti Law Group, P.C. have served Greater Boston for over 20 years. We have offices in Cambridge and Quincy. We are experienced in complicated cases involving motor vehicle accidents, motorcycle accidents, bicycle accidents and wrongful death. Our attorneys provide experienced, skilled and aggressive representation. We pride ourselves in partnering closely with clients and working to understand their individual concerns and needs. We are accessible throughout your case and advocate for you at every turn. If you or a loved one has been injured, contact Bellotti Law Group, P.C. today for a free legal consultation. You can contact us at 617-225-2100 or use our contact form.